Einztein serves as a searchable catalog of curated courses offered by providers as diverse as Stanford University and The British Museum. To find a course, enter a term in the search box and click ''search'' -– or browse the selection of subjects. You can also filter your search results by course provider, subject and media type. Finally, try clicking some of the related subject tags that you see to further refine your search. Your search results will consist of course suggestions. You can browse the course descriptions, check out which courses received a good rating, and link out for a closer look. Einztein, headquartered in Santa Monica, California, is the brainchild of three democratizers of education who believe in a world where learning should be a function of desire not privilege. 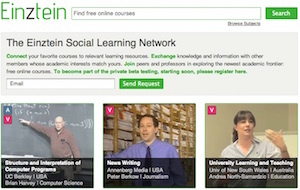 Einztein serves as a universal campus from which online learners can easily explore free online courses delivered by any combination of text, audio, video and other media. Whether you already know the course you’re looking for, or you just have a general idea, the purpose of Einztein is to make online courses easy to find. All courses featured on Einztein are hand picked by our editorial team based on their completeness and quality.